The hoisting of a special flag and the launch of a panoramic rooftop webcam were two of the highlights of an event to relaunch one of Penzance’s most prominent buildings. 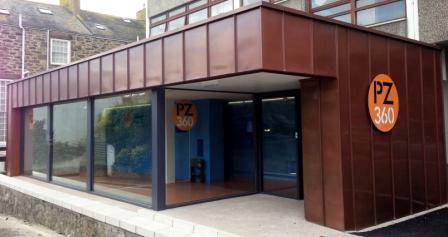 PZ360 is the new title of Penlowarth, a former HMRC tax office on St Mary’s Terrace, Penzance, that has undergone extensive renovations and refurbishment. International currency trader Tor FX and training providers Working Links are long-term tenants, while recruitment specialist Red Commerce and networking and IT expert Microcomms has recently moved to PZ360. The Workbox, a flexible office facility for freelancers and home-based businesses, has also made good use of the central location of PZ360 to base their business. A new website makes use of a live panoramic webcam that streams images of Mount’s Bay from the tallest building in Penzance.